All the Asian cuisine fans know that the regular pan or a saucepan cannot fully recreate the taste and aroma of the traditional Asian food. For that purpose, you need something similar, but still different – a wok. It is traditional eastern cookware that will finally make your Chinese food taste as if it was made in Shanghai or Shenzhen and not your kitchen stove top. Of course, there are different types of it and finding the best wok won’t be that simple, but be patient and it will pay off. This guide is made with the intention to get you a bit closer to the wok topic and introduce you to the important aspects of it. You won’t be an expert after reading a couple of rows of text, but will surely be equipped with the knowledge about the most important wok specifics you should pay your closer attention to in order to choose the best wok up to your budget and preferences. Therefore, read the following rows carefully and enjoy the ride! Depending on the material, wok will behave in a specific way. Stainless steel woks, for instance, heat up fast and don’t demand seasoning, while cast iron ones do demand it and need 10 minutes or so to heat up, but once they do, they deliver constant heat and great cooking experience… and more importantly, are cheap. Therefore, do your homework and find out which one best suit your needs: carbon steel, cast iron, stainless steel, ceramic, electric, or some other. Bigger wok means that there will be more room for vegetables, meat and other ingredients. In other words, chose the size in accordance to your needs. If you want to easily prepare the meal for four persons, go for 14” ones, and if, on the other hand, you need it only for a one-person meal, 10” wok should be your “weapon” of choice. Handles are important in order to allow you for full control of the cookware, especially if the meal itself demands a lot of stirring, tossing or similar. Also have in mind that there are different types of handles (two looped side handles, one long handle with a small helping handle on the opposite side, etc. ), that they may be or not be heat-resistant, and that they can be made out of wood – and for that reason not appropriate for ovens, for instance. Therefore, before the purchase, think through what you are going to use the wok for in the first place. If you have a flat stove top, better make sure that you get yourself a similar type wok, with a flat bottom or in the case of a gas stove, a rounded bottom, which will lead to more even and faster cooking. Also, try to find the cooking ware that has deep sides, but not too steep or too shallow, in order to get a good heat circulation. Quality, being beneficial to the customer and affordable at the same time are some of the primary things people are looking when purchasing a product. Luckily, all that can be applied to the Cuisinart 726-38H 14″ stainless steel wok that is, because of that, surely among the best stir fry pan options on the market right now. If you are into high-heat stir-frying or meat searing, this is the pan to own. Thanks to its construction, which includes a layer of aluminum sandwiched in between stainless steel layers, this wok has amazing heat conduction. This is why it can withstand extreme temperatures of up to 290° C, which makes it a perfect tool for your oven. Cuisinart 726-38H comes with a nice measurement marking for your precise cooking and special stay-cool handle. Also, it is induction-ready and has a very practical glass cover that perfectly tights the wok, keeping all the healthy ingredients locked inside this cookware, and the meal at the same time. All in all, if you want a well-made tool for healthier food preparation that has a lifetime warranty and a low price at the same time, Cuisinart 726-38H is a wok for you. If you are searching for a premium quality cookware that will quickly cook an array of different vegetables and meat and keep all the healthy ingredients kept inside the food, 14” All-Clad Stainless Steel Fry Pan is the thing for you. Because of its sloping sides, all of the food will stay at the center of the wok during cooking, which will make mixing of ingredients and addition of sauces and seasonings much easier, and turn the whole food preparation into a more than a pleasant experience. As a result of its 3-ply bonded stainless steel construction, with aluminum base, this pan attracts the heat and evenly transfers it over the whole surface of the wok, letting all of your vegetables and meat cook in the same manner. All-Clad Stainless Steel Fry Pan offers great durability, allows for safe dishwashing, can be used at the temperatures of up to 315° C and on induction type burners. It is also important is that is made in the USA, which, along with its lifetime warranty, is surely one of the guarantees of its quality. Although it has a 6″ flat bottom, don’t get confused – this is not a saute pan, but a flat-bottom wok. Actually, because of its premium quality and due to the great cooking experience, it’s one of the best stainless steel woks you can find on the market. For every newbie in the wok world, Joyce Chen 22-0060 comes as a great option. Affordable, built in a way to resemble professional cooking ware, and most importantly, great for preparing a wonderful meal, this product should be a welcomed member in any kitchen. Made out of 2mm-thick carbon steel, this wok delivers great durability and has a very sturdy construction, which, on the other hand, results in a slightly higher weight. This 14″ wok comes equipped with the ergonomic handle that keeps its coolness even during the long cooking sessions. Also, it is supplied with a similar type of small handle, which allows for easier transportation of the wok and makes the whole food preparation a more pleasant experience. On the other hand, washing isn’t one of its great aspects, because it must be done by hand. Therefore, keep that in mind if the dishwasher is your “best friend”. Thanks to its 6 1/2″ flat bottom, food is cooked quickly and evenly, allowing for chicken or beef to brown fast without sticking, or shrimps to cook evenly. Overall, Joyce Chen 22-0060 is, due to its low price and great cooking capabilities among, the best carbon steel woks you can find. Therefore, if you enjoy creating amazing food tastes, this is a cooking ware to buy. Small size isn’t necessarily a bad thing, a prime example for that is a Calphalon Contemporary Flat-Bottom Wok that, thanks to its small dimensions, allows for a much easier food preparation, especially when it comes to meals that demand stirring, tossing or turning. On the other hand, if you are preparing lunch for more than two persons, it might get pretty tricky. Therefore, if you are a family with kids, better choose similar cookware that has the capacity up to your needs. Made out of anodized aluminum, with non-stick three layer surface, this wok guarantees for easy cleaning and offers great longevity, supported with the lifetime warranty. Thanks to its traditional wok design and flat bottom, it is perfect for the addition of sauces and seasoning, but also for food searing. Its small size makes it a perfect option for ovens, although only for temperatures up to 230°C, which isn’t much, still gives it a good versatility. On the other hand, it can be cleaned in the dishwasher and used on all types of stovetops, including gas, electric, glass, etc. Also, it is supplied with a stay-cool handle for easy cooking and generally presents one of the best wok options out there. Of course, if a romantic dinner for two (as opposed to a family reunion) is your primary wok need. Finding the best wok pan for your personal cooking experiments is never an easy task. Luckily, there are products such as the Cooks Standard NC-00233 Stainless Steel Wok that offer great versatility and efficiency at the same time, and generally present a good all-around choice for the majority of users. In other words, if you are not sure about what you need, this saucepan look-alike wok will be a perfect fit. This 13″ wok is made out of two layers of 18/10 stainless steel with a 5″ aluminum bottom that guarantees for a quick and even frying, sautéing or cooking of your vegetables and meat. The pan itself is supplied with V-shaped stainless steel stay-cool handle for easy handling and a smaller loop type handle on the opposite side, for a similar purpose. Also, this wok comes in a package with a stainless dome, which just adds to its overall versatility. Usable on every type of stove tops (gas, electric, glass, induction, etc. ), washable in a dishwasher and safe to be operated on temperatures of up to 260°C, this wok offers a great sum of features and presents more than a good value for the money. One of its rare downsides is its size of 23” (including the handle), which makes it not that suitable for stoves. Therefore, if that is your main field of use, better look for a different product; otherwise, Cooks Standard NC-00233 is a perfect wok choice. If you are looking for the best cast iron wok at a fair price, Lodge Cast Iron Wok comes as an excellent option. With great heat retention and even heating characteristic, this cookware is an exceptional cooking tool, which will instantly turn you into a master chef of Asian cuisine. 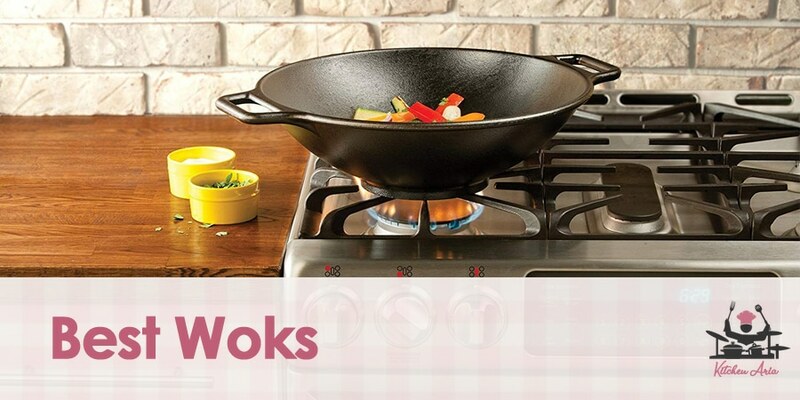 Whether you are preparing vegetables, stir fry or sear beef, this wok will do it quickly and with no pain. The only issue is that you will need to heat it up for 10 minutes or so before you pour your food into it, but after that – everything is simple, the ingredients do not stick to it, and cleaning is fast. The only issue is that it must be done by hand, and hand dried after that, in order to prevent its rusting. Lodge Cast Iron Wok comes pre-seasoned, with a fully rounded inside and a flat base, which makes it more suitable for flat stovetops, including induction ones that it’s fully compatible with. Also, the wok itself is equipped with two looped handles (that, unfortunately, aren’t stay cool, but are still pretty handy). With sturdy construction and size of 14” in diameter, which makes it suitable for use in the oven (at up to 260°C), and generally good characteristics, this USA-made wok is a must-have for every fan of Asian dishes. Durable, with an exceptional two-coat Excalibur finish and made out of 2 mm-thick carbon steel, Helen Chen’s Asian Kitchen Wok before anything else looks like a tough product that can withstand a lot of maltreatment. It is designed in a way to suit every type of stovetops, including gas, glass, induction, etc. Unfortunately, the wok must be hand-washed, but that can be easily done with just a slightly soaped sponge, that will do the job in seconds. What isn’t that great is the seasoning that must be done before the first use and takes about five minutes, but looking at the bright side, it needs to be done just once. Helen Chen’s Asian Kitchen Wok heats up fast and retains heat much better than other similar products, which will surely impact your cooking results positively. It is made in the USA and it is 14 5/8“ in diameter, which gives it more than enough space for a decent sized meal. One of its downsides is its large weight, but luckily there are also two handles (an ergonomic skillet and a small helping handle on the opposite side) that make handling much easier. Altogether, the best non-stick wok at an affordable price is in front of you. For everyone looking for a basic wok, that will do a quality job and won’t cost you a fortune at the same time, Craft Wok Traditional Hand Hammered Carbon Steel Wok comes as an ultimate solution. With this one, you will get a quality build, as close as possible to the traditional woks, partially because it is hand-made in Guangzhou, China by the local hammer professionals. It is rounded inside, which is why it cannot be used on flat stove top, including glass and induction one. With this one, you must fully stick to the tradition and use it only on gas or similar type stovetops. One of its downsides is that it must be seasoned before the use. That might present a problem for inexperienced users, but it is a necessary part of making the wok fully functional. Craft Wok is made out of 1.8 mm thick carbon steel, which makes it highly durable, and comes with two handles that aren’t stay cool ones, but will not burn you either. Perfectly sized for both a large family and a two-persons meals, Craft Wok is one of the best wok options for fans of simplicity and quality cuisine at the same time. The people searching for an easy wok that’s simple to use, but who are not that demanding considering the authentic aroma that the traditional woks are bringing to the food, should seriously consider Presto 5900, the best electric wok money can buy. Pretty similar to the classical electric skillet devices, this wok allows for fast heating and easy maintaining of the predefined temperature. With this one, you are getting practicality, portability and simplicity of use that is incomparable to classical cook wear. All you need is to plug the device in and cook. Unfortunately, food aroma and the taste aren’t as that intense as that of the non-electric woks but is still tasteful and surely worth buying. If you need it for stir-frying, browning, or any other similar cooking activity, this is a product to own. Made out of stainless steel, with aluminum base and with 1500W of power, Presto 5900 is a sure thing if you want to get yourself a quality tool for making traditional Asian food. Being dishwasher safe and with exceptional performance capacities, this wok will deliver everything you would expect from a product of this type. If this guide helped you at least a little bit in your search for the best wok in your cooking journey, its purpose is more than fulfilled. In that case, everything that can be said is “Bon Appétit” and enjoy the adventure.